Home Can You Park on a Single Yellow Line? Can You Park on a Single Yellow Line? Almost everywhere we drive there seems to be parking restrictions and laws in force. Other than the police, local councils in particular appear to be finding new methods to increase parking regulations they can impose on motorists. No stopping – literally prohibits you to stop at the side of the road at any time except in emergencies. No waiting – Allows you to stop on the lines momentarily to set down or pick up passengers and load or unload goods, except if there are loading or unloading restrictions in place. No parking – Parking is defined as exiting and leaving your vehicle unattended. When the restrictions are in force, single yellow lines have the no waiting and no parking regulation, meaning it is permissible to stop, load or unload goods, set down or pick up passengers. Providing this action is continuous and does not exceed a reasonable amount of time that the actions in question would normally take, it is not defined as parking. whilst setting down or picking up passengers, you must remain in your vehicle unless the person(s) require physical help in order to enter or exit the vehicle. Most single yellow lines have part time parking restrictions. Those that do have a sign, or time plate close to the lines detailing what times it is prohibited to park there. An example of the yellow time plate can be seen on the image o the right. The circular blue and red no waiting sign is contained within the plate along with the hours that the lines are in force. If no days of the week are displayed, it means the line restrictions are in force during the times shown, 7 days per week. 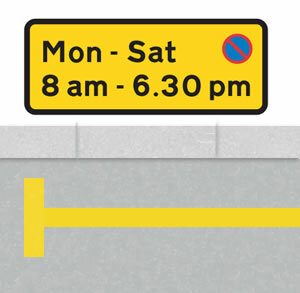 Using the image to the right as an example, it is permissible to park on the yellow line from 6.30pm through to 8am Monday to Saturday and all day Sunday. If a time plate is not on display, you can assume restrictions apply 24 hours per day, 365 days per year. In many cities there are Controlled Parking Zones (CPZs) that display parking restriction on a sign before entering the zone. Disabled drivers who display a blue badge are permitted to park on single yellow lines within its hours of operation for a maximum of three hours. 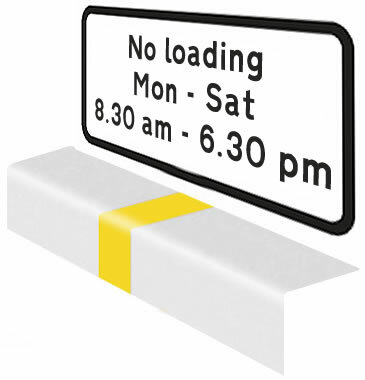 During a single yellow lines hours of operation loading or unloading is permitted for a maximum of 20 minutes for private vehicles and 40 minutes for large commercial vehicles although specific times are dependent on location. Extra time can be applied for by contacting the council authorised for that area. You must ensure however that you are not causing an obstruction and that there is no loading restrictions in place. Kerb markings as shown in the diagrams below dictate whether loading and unloading is permissible. Single kerb markings indicate a part-time restriction where specific times are displayed on a time plate close to the markings. 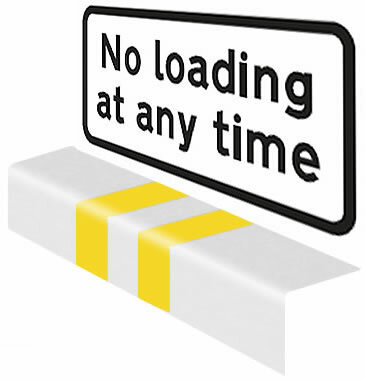 Two yellow kerb markings close together indicate a no loading at any time restriction ban. Although possible, police tend to no get involved in issuing parking tickets unless the vehicle is causing an obstruction or is hazardous to pedestrians or other road users in parking restricted areas. Councils are appointed with the authority to manage and maintain parking restrictions within their boundaries. Traffic wardens, otherwise known as Civil Enforcement Officers will issue parking tickets to any vehicle that is parked illegally, including single yellow lines inside their times of operation. This falls under the contravention code 01 parking prohibition: Parked in a restricted street during prescribed hours. Parking tickets otherwise known as Penalty Charge Notices (PCNs), usually see a motorists fined around £60 or more for serious parking offences that cause potential hazard or danger for pedestrians or other road users. Fines are typically reduced if paid within a certain time. If there is Single yellow lines in a Car Park does this mean it is purely for Disabled parking only? Car parks are a little different to normal roads. It depends on whether the car park falls under regulation from local authority, or whether it is private land owned by a supermarket for example. If it is local authority, the same rules will apply on the car park as those on the road, so single yellow lines will have restricted parking (for any driver) and typically bays will be used for parking (same as on a normal road). Private property that has public access such as a supermarket car park still must follow the Road Traffic Regulation Act, so you can’t drive on it uninsured for example. In terms of parking, this will be for the land owners to enforce if at all.